I thought I would take a nice warm bath and read a magazine to relax. It took about five minutes before I heard things falling on the floor and knew the yellow furry girl was at it again. Of course when I came out, I got that look again. No, she would never do that. 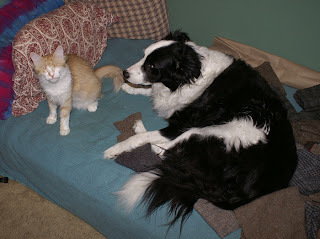 Then Casey had to check it out and Dora sat on the chest and tried to tell me he did it, haha. He had an alibi, he was in the bathroom with me. This week my son is moving into a new apartment that doesn't take pets. He wants me to take his cat, but we call her "Psycho Kitty". When ever she has come over, she hisses and charges at us. So far she is hiding out in the basement, but Dora has decided we got her just for her. 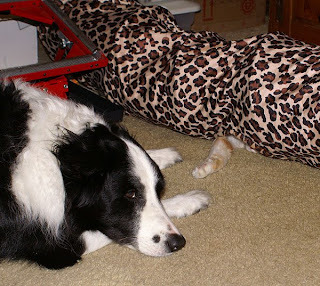 Dora spends her free time harassing her and chasing her, so it has calmed their cat down some. It finally met up with a cat crazier than her. Today she did touch the dogs nose, so she is getting braver and figuring out that hissing and being mean will get her no where in this house. I guess I should ask my son what her name is, lol. I love it when we have an indian summer, well half the week at least. It seems we have a few cold days, a few rainy days and a few warm ones. The saying in New England is, "If you don't like the weather, give it five minutes". We took advantage of the nice weather and went for a walk at the sanctuary. It is a beautiful walk, and I never tire of it. We saw a few small creatures scurrying about, getting ready for winter and the ducks and geese were enjoying the shelter of the pond. The trails are very diversified. It starts out in the fields and takes you to a path in the woods which comes out to a point, where you can see water on both sides. At the end of the point, they have a little tower that you can sit at and enjoy the view. 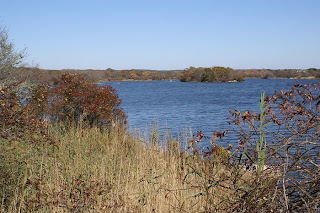 The cove is surrounded on the outer edges by a beach barrier, but you can see the ocean and Block Island on a nice day. The inner cover is filled with wild birds, duck, geese and swans. 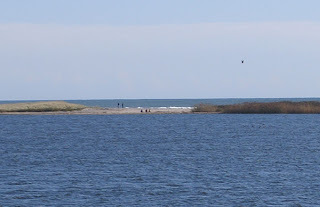 The birds were all hiding behind the small islands to keep out of the wind. 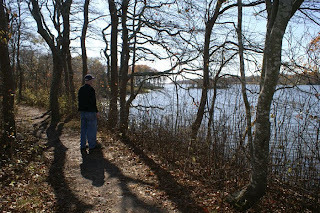 You can see a bit of foliage, but along the coast the salt air tends to lessen the colors on the trees. I took some shots of the other areas of my room, so you can see how I have it set up. I retook the corner shot first, I changed the wall quilt and put a larger one that I made. That was done for a quilt challenge, where we had to send each other fabrics and embellishments and create a quilt with them and this is what I came up with. This area is my work station. I used my old large dining table, so I can cut, piece, or pin my projects on a larger surface. It also hold assorted items for now and my serger for rugs. Eventually I will get a real iron board, need a bigger one for the quilts. Shows you how much I iron;) On the wall I have baskets which will be filled with precut squares from scrap fabrics. I plan on having more baskets and filling each one with different colors. I hung my rulers on the wall with hanger tacks, they are great for rulers and easy to put in. Then books and assorted items on my shelf. The other wall holds my larger cabinet. It is perfect for all my fabrics. 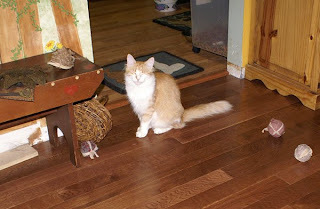 The cute kitty in the corner was a gift from my husband last christmas. It is nice to have a husband who doesn't mind my obsession with cats;) The beautiful cat rug was made by my friend Kelley, it was a late christmas surprise, I just love it. Eventually I will add more wall cabinets and curtains, but it is a nice place for me to work and be creative. 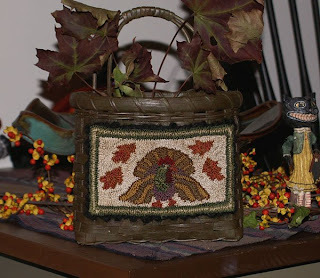 I finally got around to mounting my punch needle turkey. I wanted to put it on a basket and couldn't find any good ones in the stores, so I took one of my old ones and repainted it. I love how it came out, it has a nice prim green finish. 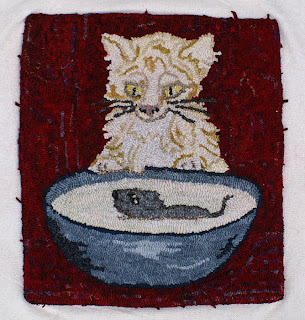 I made this pattern once as a hooked rug. It came out really nice and it was for a rug swap, that was three years ago, still waiting for mine, haha. If you like this piece, I have it on ebay tonight and would love to see it go to a good home. I am not sure how much I will sell on ebay this season, but will try to make one item a week. I have lots of friends and presents to make, so will be working on those soon. My husband redid a room, so I could have a room just for sewing. I am enjoying sewing again and making quilts and it is nice to have to room to sew and places to work on projects. 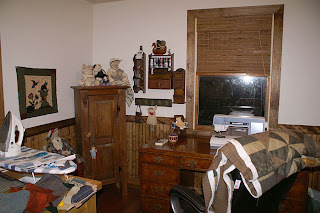 This is a section of my sewing room. 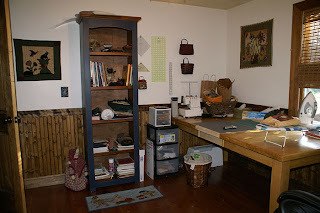 I used my big old desk for the sewing machine, love using it and the drawers are perfect for putting the accessories in. The little cabinet is where I hide my paints and other items. 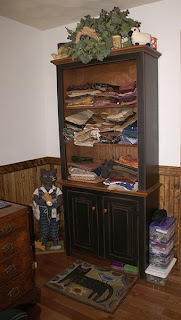 Eventually I will change it out for a larger unit with shelves for my fabric stash. To the left of that, along the wall, I have my old dining table, perfect for piecing and cutting. 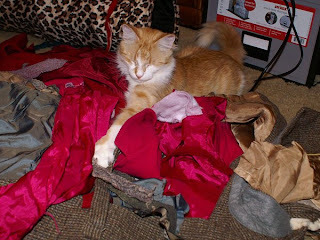 I also have my serger there, which I use for the edges of my rug backings. It is a mess right now, so pictures of that side will have to wait;) I still need to make curtains and add more wall decor, but it is getting there. I have been busy finishing projects. One being a UFO challenge. We had to pick a pattern we never made and finish it. Since I make my own patterns, I used one I made years ago and never bothered to do. It was on rug warp, so it was a pain in the neck to hook, I only use linen now. This is what I ended up with, I still want to redo things and working on shading, so hopefully it will be better when I am done playing with it. I cannot get true colors with the red background, it is not as bright as it looks. THe original pattern was from a postcard and I decided to make the kitty look a bit like Dora, not an exact likeness, but some similarities. Well, I was going to show some more pictures, but blogger is being finicky tonight and it is late, so they will have to wait. I think we are all being hit with the cost of gas and living in general, so what is better than freebies. These sites are great for information and free patterns. Some have patterns that change monthly, so well worth revisiting. If you have any favorite places to find free patterns, let us know by leaving a message. To start off, here is a free pattern from me. 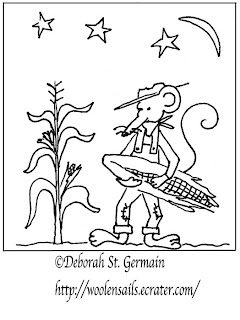 He would be fun for a punch needle piece or you print it out as a coloring page for your kids. Here is enough quilting pattern links to keep you sewing all year. This site has great seasonal quilts and lots of animal patterns. I made this piece as a rug and the pattern is in my fall booklet. I thought it would be fun to try in a punch and this is the result. This piece is on ebay if you are interested in placing a bid. The pattern for this piece is in my ebooklet, "Spellbound." You can link to my ecrater site in the left hand column. It does look good with my new displays. I am surprised the new outdoor berries are still there. 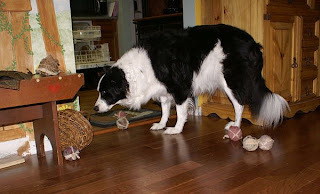 I figured Dora would have played with them while I was sleeping, but she seems to be ignoring them luckily. If I catch her near them, I will have to take them out, I don't want her eating them. She does seem to like fake plants though, so I moved all those up higher. We spent the day shopping and hitting the antique consignments, but seems they were all closed on tuesday, figures. I recently won a challenge and was given a beautiful hand made pottery bowl as a gift. It is hard to see in the picture, but I wanted to display it and have a bit of fall in the house. I decided I would make that the centerpiece and design around it. I had no table topper and wanted something now, so I took an old table cloth that I had made years ago and cut off a piece to fit the table. I sewed the edge to leave a half inch for fraying. I frayed two sides, the others will fray on their own as I wash it. 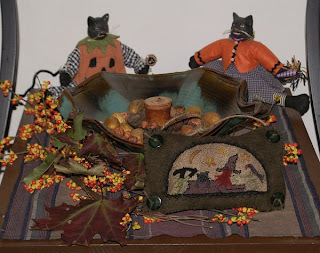 I put out some halloween things that I had in boxes and the filled the bowl with nuts and some little pumpkins that were also given to me as a gift for the challenge. But, the table still looked bare, so I went out in the back and cut some yellow berries from the vines that grow all over the fence. 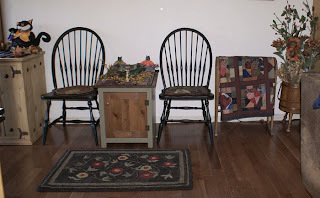 I put a crazy quilt I made next to the chair, but I will have my husband make me a ladder to put in it's place, then I can add quilts as I make them. 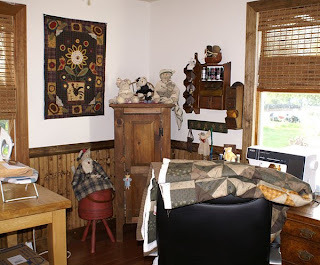 I am also working on a quilt to hang above the chair area, so the house is getting decorated slowly but surely. 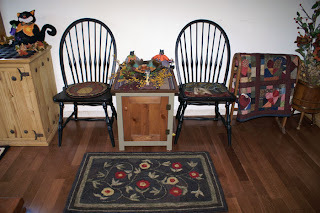 The rug in front is one I made for my sewing room, but I use an office chair and wheel around the room and the rug got in the way;) The chair pads are ones I made and do not match as you can see. I will be making braided mats for all the chairs, in red and black with some golds. We also will be putting up wainscoting and the sideboards, but can only do so much at a time. Well, the good news is a few more boards and the floors will be done, yeh! Spent the day cutting again and got more done today and only about 5 more jackets to go. 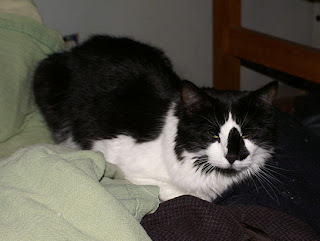 With all the noise going on, Casey and Dora hid out with me, but Casey was not amused by Dora's antics. Then it was onto the mattress I was sitting and cutting on, she decided to help with tearing some wool apart. 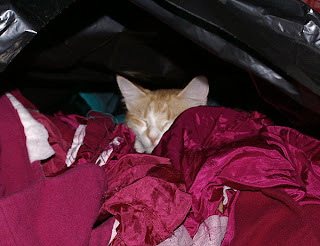 After all that hard work and play, Dora decided it was time for some rest and what better place to nap than a big bag filled with discarded wools. And this is the result of all that cutting. It is alot of work, but I got a great selection of wools for hooking, braiding and rag rugs. If you consider that I pay a dollar an item, that pile of wool would have cost me a bundle if I had bought it new. Some wools will stay as is and others will be over dyed. The ugly pinks will become a deep prim rose for a new rug I am planning. Today my husband was back to work on the floors, so I had to give up my living room for this weekend. I decided it was time to make a dent in the thrift wools that have been sitting and waiting to be cut up. 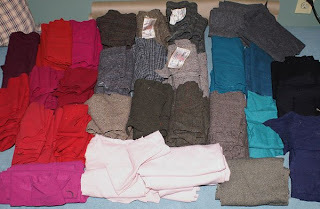 This is what I did today, a couple are new buys, but most is the older wools I bought and wasn't thrilled with. Now I need new blacks along with thick and thin wools for braiding, so I am glad I decided to keep it. 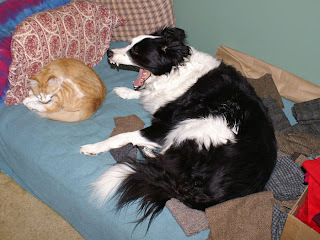 It is a pain, but it is how I can afford to make hooked rugs and all of the other wool projects, I love to do. 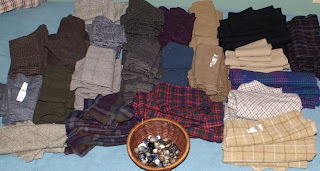 If you want to try thrift wool, check out your local salvation, goodwill or savers. Check you labels, 100% wool, will usually have a tag, unless someone ripped it out. Sometimes I take chances and buy wools without tags and do the burn test. Wool will burn, but not stay lit, it goes out on it's own. It will turn into a powdery ash, so rub the ash when cool and if it is hard or turns into a ball, then you probably have acrylic in it. It also smells like burning hair. 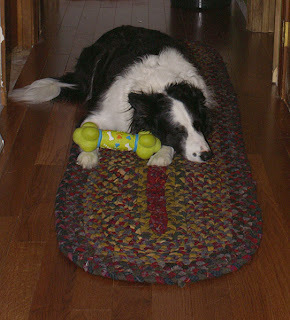 If you are making rag rugs a bit of other fabrics won't hurt, but wool will hold up for years and repels dirt naturally. Also, if you want to dye your wool, acrylics will not take the wool dyes, but nylon will. So, don't be afraid to grab those jackets that have 20% nylon. Another thing you can watch out for is the wear on the jacket. 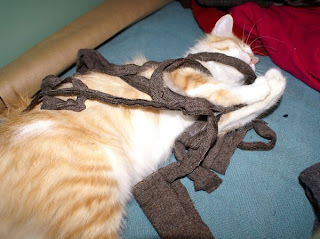 If it is worn or knubby, it usually is not wool. When you buy your jackets, make sure to wash them right away, you never know what is in them and moth eggs could be hidden inside. Just throw them in a warm/cold wash and then in the dryer. Don't forget to save the good buttons. They are great on dolls and penny rugs. I finally finished my braided rug last night and as you can see, my big baby loves it. He has been having a tough time walking on the wood floors, or in his case running after the cat, so I wanted to make a quick runner for the hallway. I used scrap wools and did a rag braid and tied off the pieces by slitting the ends and knotting them. It went pretty quick, but I am glad it is done. I love braiding, but not when I am in a hurry to get it done. Now I can take my time and work on hooked rugs for the house, going to need a few big ones. Now I am working on a wall quilt for me and finishing a rug challenge. It is nice to make things for myself for once and it is time I decorate my own house;) The runner is 80" x 20". It took me about a week to make it. Now we still need to put in the wainscoting and trim.